Three weeks ago, I made aliyah. It had been a long time coming, something that I have been thinking about, dreaming of and longing for since I was first faced with saying goodbye to Israel after a year of living in Jerusalem in 2012. Back then, months before I even had to go back to the States, I had already made a plan to return to my new beloved homeland; I knew I was far from finished with life here, and the thought of leaving filled me with the dread of an impending loss; there was a farewell on the horizon that I couldn't bring myself to face. When I did return to study at Pardes for a second semester the following spring, the need for a more permanent solution to the constant longing to be in the land aggressively occupied my thoughts. I didn't want to be an occasional visitor, leaving my heart in Jerusalem every time "the real world" beckoned me back to the States. When I was away I missed everything about being here; from the warm and multi-faceted communities that became like second family to me, to the possibility of treading a richly, Jewishly spiritual and meaningful path in the heart of the Holy Land, to the religious, cultural and political significance thriving right in my backyard, to the street shwarma, and the very flavor of the air I breathed, I knew with utter certainty that I wanted that to be my new day to day life, always. There is just absolutely nothing in this world like waking up in the morning to Jerusalem. I suppose you could call my experiences leading up to my aliyah something of a whirlwind romance; I had just completed Jewish conversion two weeks before my plane touched down in a strange country that I had never been to, and while many people spend years contemplating taking the plunge with aliyah, the decision for me, deep down, was rather fast and on the surface even impulsive. The longing and yearning to be here was overwhelming and all-consuming, and made "normal life" back in the States seem like a shadow existence that lacked substance and deeper satisfaction. Life in Jerusalem on the other hand, was like love at first sight. Admittedly, my love affair with Israel sounds like an idealized romance that seems to only be true in Disney fairy tales. While I enjoy such fanciful stories, we all know that underneath the magic and facade of perfection, is the reality of the situation: infatuation disguised as love. 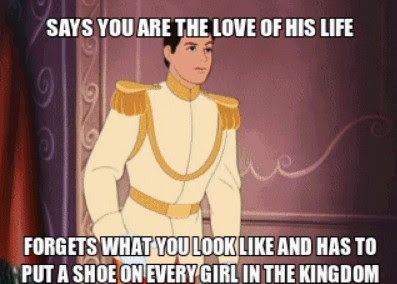 After all, Prince Charming is about as charming as a cardboard cutout through anyone's eyes except Cinderella's, and I give their marriage six months, tops. "Kol ha'kavod! Your strength and determination is so admirable." "Mozel tov! Now what are you going to do to make a living? Because nobody here ever has money. You know that, right?" "Why are you living in Jerusalem? You'll never learn Hebrew here. You should be learning Hebrew, like, yesterday." "Mozel tov...any regrets yet? No? Just wait." "Nobody who starts out on a year program here really wants to make aliyah. They do it and then they regret it. You don't really want to be here for good. You'll see." "No seriously, why would you make aliyah? Are you a masochist?" "So when are you going back to the States?" Many of these reactions, as you can see, are less than helpful. Anyone who has spent significant time in Israel knows that this country is far from perfection. This love affair is not simple and is far from idyllic. For instance, Israeli bureaucracy is a wonder to behold in its Kafkaesque senselessness. A simple trip to the post office becomes an exercise in patience. People run into you with their shopping carts to let you know that you are in the way in the grocery aisles. Israelis are not shy about telling you exactly what they think regardless of how welcome or unwelcome their opinion is, and like any new immigrant coming to a foreign land, language and cultural barriers are bound to jump out at you at every turn. And of course, there's always the precarious political situation we find ourselves in with our Arab residents and neighbors, and Israel will never win a popularity contest among the nations of the world. Nobody would ever make the argument that living here is easy, simple and always like living a dream. You're going to feel an overwhelming amount of anxiety and fear. It's normal, and it will come and go in waves. You will cry yourself to sleep more than once. You will cry in the shower in the morning as you question the sanity of your decision, and you will cry at random points throughout the day, for no apparent reason. You will feel the urge to cry when it is completely inappropriate, absurd and even comical. Let it out, and then move on. You will wonder why you made such a stupid and rash decision. Then something wonderful and seemingly small will happen, and you'll remember why you are here, and wonder how you could ever question yourself in the first place. This could happen repeatedly throughout any given day, up and down, like a roller coaster. Just go along with the ride. Other people's opinions about your aliyah are irrelevant. Don't let jaded, cynical people tell you how you should feel about what you are doing with your life. It's going to be tough, and you knew that. You aren't here because you think an easy life is automatically the best life. You worked to make this work, and some of the best things in life come as a result of hard work. Seek out like-minded friends and peers who will support you during this transition. If there was ever a time to say goodbye to the lingering Negative Nancies sucking the positive vibes out of your life, it's now. Think of aliyah as a chance to start over, or at the very least, a chance to do things the way you want to do, and in your own way. And to the olim who have been here a while and feel the need to rain on the parade of the new arrivals, repeat steps 1-8 yourselves. Maybe you'll rediscover that spark you once had with Israel. Rekindle the relationship and remember why you are here. Or don't, but hush up about it. If there's trouble in paradise, maybe it isn't all Israel's fault, and as a new arrival still in the honeymoon stage, it's not my fault, either. It's not me; it's you.